During the 1950's it was possible to improve the performance of your "sluggish" side valve Morris Minor by fitting a Mazengarb conversion kit. The Mazengarb kit was an overhead valve conversion manufactured in Australia. Very few of the OHV heads now exist probably because the price of 50 pounds was very high in those days. In addition, the Mazengarb kit had to compete against the new o.h.v. Morris Minor and the popular General Motors Holden six cylinder car. The Mazengarb conversion not only greatly increased the performance of the car, but had the additional advantage of overcoming the problem of fuel vaporisation. On the original side valve engine, the fuel pipe runs about 3cm behind the exhaust pipe and gets VERY warm. The conversion requires the inlet and exhaust manifolds to be changed over to the driver's side away from the fuel piping and pump. Apparently only three heads are still in existence; two are operating and the third is damaged beyond repair. The following article from Modern Motor magazine, October 1954, reviews the Mazengarb OHV head conversion. According to the article, seven prototypes were made so there is a possibility that other heads may exist. If a pre-1953 Morris Minor beats your Zooper 40 from the lights one of these days, don't rush to the conclusion that your engine is due for an overhaul. Chances are the Minor will be one of those Series MM jobs that have had the original side valve head swapped for a new overhead valve top-piece. The side valve Minor, while an admirable performer in every other way, is commonly derided for its leisurely pick-up; but fitting an o.h.v. conversion unit gives it the take-off of a startled rabbit. It also produces a surprising new tenacity on hills; the once over-worked gearshift gets a rest, while the car climbs rapidly and smoothly over inclines that normally would have reduced it to a second-gear crawl. No, we're not talking through our hats. We were just as incredulous as you are - until we gave the conversion a thorough test and found it completely alters the character of the car, doing away with its only shortcomings. Claimed to improve hill-climbing and acceleration by 35 per cent, the o.h.v. conversion kit is made at St. Marys, N.S.W., by Gear Manufacturing Co. Pty. Ltd., and sells for 50 POUNDS. It is fitted at the factory in five to six hours for a small extra charge, but an owner with average mechanical ability can do his own conversion in 12 to 14 hours, working from easy-to-follow fitting instructions. Made of cast-iron, the new cylinder head is cast in one piece, with a separate cast-iron water gallery and a separate solid aluminium rocker cover. 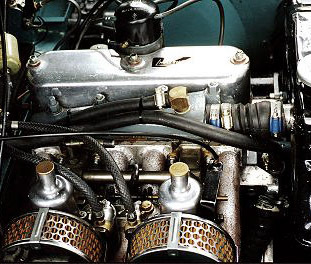 The same valves and valve springs are used as on the side valve Morris Minor (in fact, the original ones are transferred to the new head). The head is cored for complete water cooling, and the water gallery conveys water from the head to the radiator on the offside. Being on this side, the gallery is located above the ports and manifolds and is fixed with four of the cylinder head studs. The same number of studs are used for the o.h.v. cylinder head as for the side valve, but longer ones are supplied. Taking the water off on the offside ensures complete cooling of the exhaust and inlet passages. A new inlet hole is made in the radiator header tank, and a tube supplied is soldered in position. The water jacket allows water to circulate round each valve seat. A soft paper gasket is used between the gallery and the head, and the face of the gallery is ground. A copper asbestos gasket is used between the cylinder block and the head. The overhead valves are operated by push-rods that are themselves operated from dimpled tappet heads, or cam-follower heads, from the existing camshaft. The flat-headed screw of each existing tappet is removed, and the dimpled tappet head replaces it to locate the push-rod. The rocker gear is, of course, new. Cast nickel-chrome steel rockers are employed. The push-rods operate through eight steel tube inserts. Tappets can be adjusted either from the rocker screws at the top or from the cam-follower screws at the bottom. (Clearances are 12 to 15 thou, inlet and exhaust, when cold). A good point is that secondary tightening of the cylinder head can be carried out with the rocker gear in place. 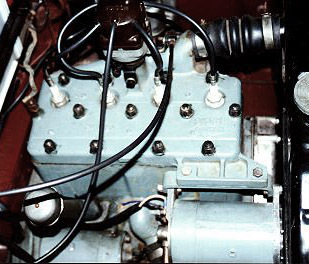 Siamesed inlet ports are employed, together with individual exhaust ports. The standard side valve Morris Minor manifolding is used, but it is transferred to the offside. Combustion chambers are of orthodox lozenge shape. Compression ratio with the new head is 7 to 1 for touring, but provision is made for considerably increasing this ratio for sports work. (Normal compression ratio of the side valve Minor is 6.6 to 1). It is claimed that the new o.h.v. head enables 35 b.h.p. to be obtained at 4400 rpm, as against 27.5 bhp for the side valve at the same revs. Engine capacity remains the same at 918 cc Maximum revs are the same for both, but the o.h.v. head is claimed to improve hill-climbing and acceleration by 35 per cent. By fitting the duplex valve springs readily obtainable for side valve Minors, valve bounce can be eliminated and maximum speed raised to 75 mph or more. The overhead valve gear is pressure-lubricated from the by-pass take-off and pipe. The take-off is at the nearside of the engine - from a T-piece at the existing oil pressure gauge feed union. Under engine oil pressure, the lubricant is fed through a copper pipe to the hollow surface-hardened tubular steel rocker shaft. It then passes through holes in the rocker shaft to lubricate the push-rods, rockers and valve guides. Finally, the oil drains down the push-rod tubes and back into the sump. 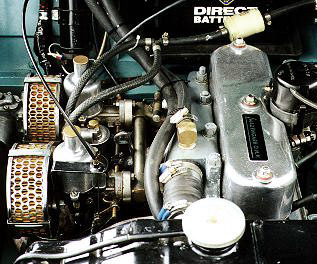 A soft paper gasket is used between rocker cover and cylinder head. All the cylinder head faces are ground, and the face of the rocker cover is machined, thus providing an oil-tight fit. Held in place by three wing nuts, the cover is made of polished cast aluminium and is very solid, thus reducing noise from the overhead valve gear. AC 10 mm spark plugs, which are readily available, are included in the kit. They have been found most suitable by the Gear Manufacturing Co. for cool running and efficiency with the conversion cylinder head. Included in the conversion kit is a flexible length of exhaust pipe to take the gases back from the manifold to the silencer. New manifold bolts are supplied. The distributor is mounted on the nearside of the head, in the same position as before. Petrol consumption is claimed to be the same with the new head as with the side valve, i.e. 37 to 38 mpg No alteration in the carburettor setting is necessary; improved volumetric and thermal efficiency enables more power to be obtained from the same quantity of fuel, and there is no increase or decrease in consumption. The manufacturers stress that the new cylinder head is quite orthodox. At the time of writing, seven prototypes have already completed a total of 30,000 miles between them, with no trouble at all; it has not been necessary even to adjust the tappets. Orders are now in hand for the first production batch. Distributing agents will be appointed for the complete kits, and for spares such as head gaskets. The Morris Minor conversion kit will be followed by one for the Ford Ten; this second kit will be available shortly. All Morris Minors converted at the Gear factory are taken on a standard test climb of Lapstone Hill, near St. Marys. With two people, and from a standing start, the car must reach the top of the hill in three minutes, using top gear all the way (except, of course, when the driver is changing up through the gears immediately after the start). Assuming that the car is not baulked by traffic, this time can be achieved in a Minor fitted with the new cylinder head; whereas, under the same conditions, the best time obtained by the Gear Manufacturing Co. with a side valve Morris Minor was 3 min. 41 sec., using top and third gears. "Acceleration and hill-climbing are definitely much better than with the side valve model. The car is altogether livelier and more responsive. Even though the bottom half of the engine had seen a considerable mileage, the unit proved a glutton for revs. With Mr Mazengarb at the wheel, we tackled Lapstone Hill, two up, from a standing start. We were soon in top gear and cruising up the hill with the speedometer needle hovering between the 50 and 60 mph marks. It looked as if we were all set for a three minute climb, but unfortunately a heavy lorry blocked our passage on one of the bends about three-quarters of the way up, and there was a car coming down the hill. We had to brake, pull in behind the lorry and change into third gear before going past - which obviously would not have been necessary if the road had been clear. Although the car's speed had to be reduced to about 24 mph while following the truck, the revs built up again after passing it and we finished the climb in top gear. Despite the delay, we reached the top in 3 min. 10 sec. I got the impression that a three-minute climb in that car would have been a 'piece of cake'. I drove the car back to the factory and was able to try out the revs at the top end of the scale on the mile or so of derestricted road between Lapstone Hill and St. Marys. The way the car performed was something of a revelation. I have driven the side valve model and could therefore make a direct comparison."